Oklahoma Connection | Hayes came to Oklahoma as a teacher at Ryan in Jefferson County. In 1943, Judge Hayes was commissioned by the mayor of Oklahoma City as an Ambassador of Good Will in honor of his membership in the state’s Constitutional Convention. Samuel W. Hayes was born in Arkansas and attended the University of Virginia before coming to Ryan, Oklahoma, as a school teacher. He was admitted to the bar and began his legal career in 1900. He was Ryan’s City Attorney until he moved to Chickasha in 1902. In November of 1906, the Democratic Party unanimously nominated Hayes to serve as a member of Oklahoma’s Constitutional Convention in Guthrie. He became a member of the state’s Supreme Court in 1907 and served in that capacity until 1914. 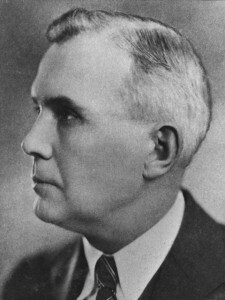 Judge Hayes was also a director of the First National Bank and Trust Company of Oklahoma City, the American First Trust Company and the Citizens National Bank of Chickasha.